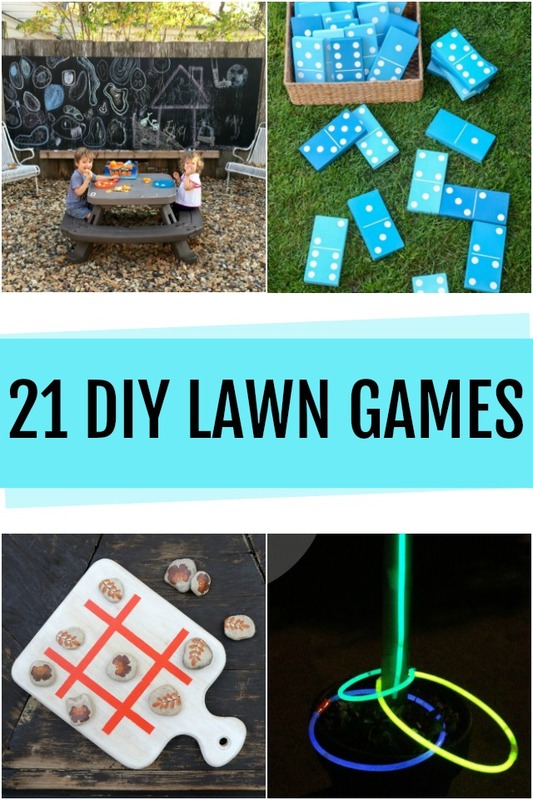 21 DIY Lawn Games - C.R.A.F.T. Oh summer time, you make my heart happy! Sandbox, sprinkler, tic tac toe, giant dominos, extra large Jenga? I mean who can resist an extra large Jenga set?! I’m a game enthusiast and now that Maxwell loves to be outside, yard games that everyone can enjoy are a must. 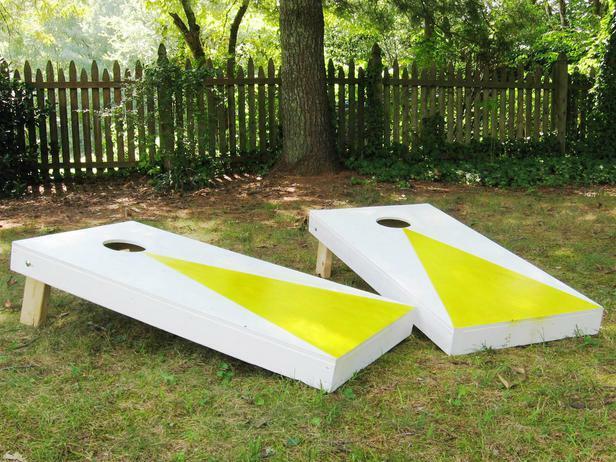 Here are 21 DIY backyard games for your yard, deck, or patio that everyone can enjoy! If your kids are anything like mine, a sandbox will keep them happy for hours! This gives you more time to play fun lawn games like corn hole and ladder golf! 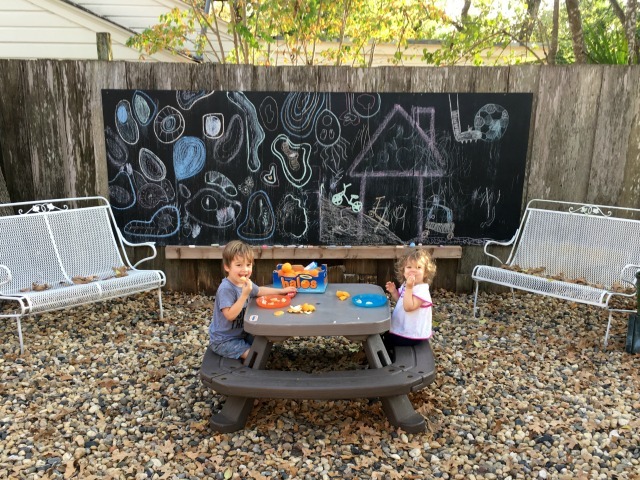 Kids and adults will love the giant backyard chalkboard! It’s as easy as painting plywood with chalkboard paint and screwing it your fence. I love that the chalk baord can double as a game board for simple games like Hangman and Tic Tac Toe. For the complete tutorial check out C.R.A.F.T. 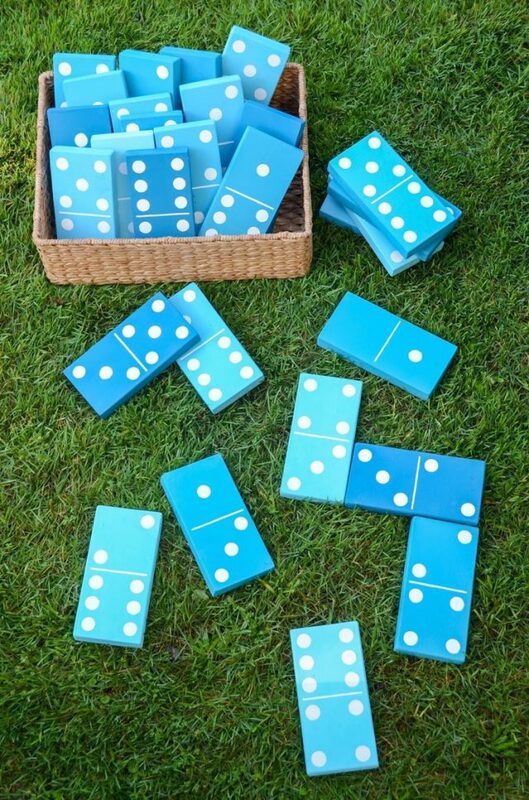 This set of dominoes will provide hours of fun and doubles as an adorable decoration. I mean how cute are these gradient dominoes in blue hues? See the complete tutorial at iron & twine. If making them is not in the cards for you this year, here’s a solid wood set on Amazon! If you love Bananagrams, this giant backyard version is sure to be a hit! The best part is you can make it yourself with cardboard and paint! See more details at Constantly Love Struck. This is one of our favorite backyard games, and Andy built us a set using this tutorial. I sewed the bean bags for hours of backyard fun! Here is the detailed tutorial. 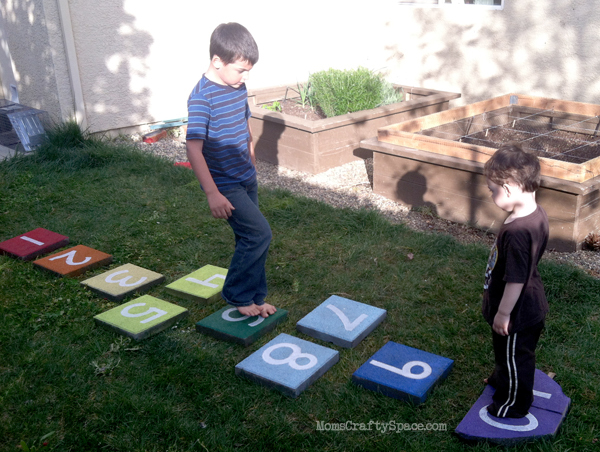 Af first glance, this rainbow paver hopscotch is for kids, but I promise if you give it a try you’ll be hopping around the backyard too! Plus, it’s so pretty! See the complete tutorial at Happiness is Homemade. Tic tac toe is such a fun game for all ages! Best part? 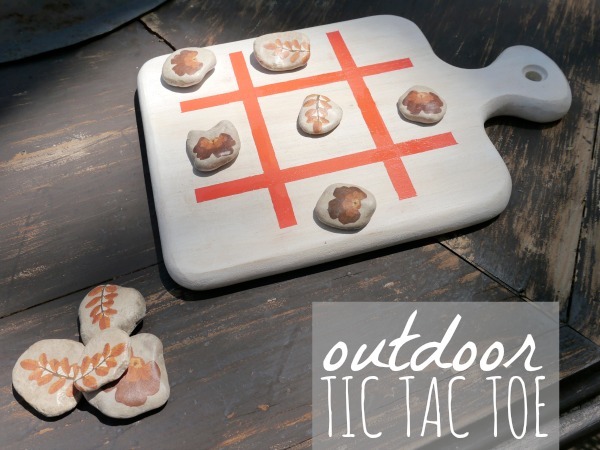 This tic tac toe game gave a cutting board a new life. To make a giant gam board you’ll need masking tape, 2 dice, and chalk. There is no wrong way to play this game and you can change the squares to read whatever you’d like! Some examples are “water balloon fight” or simply “jump on the trampoline”. For more details check out Design Dazzle. 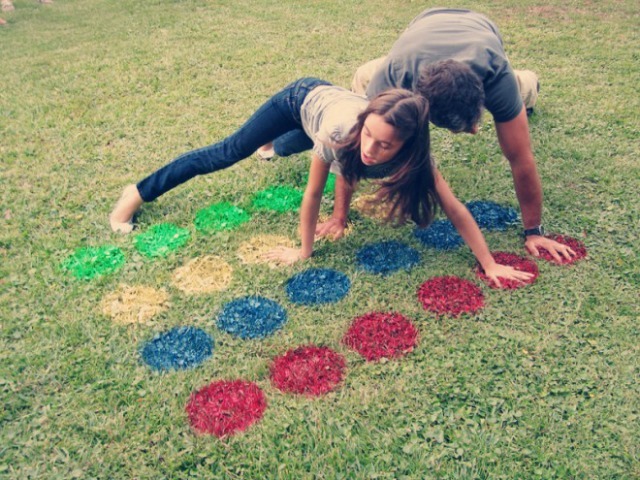 All you need for yard twister is a poster-board stencil and 4 cans of colored spray paint. This game is such a winner because it is great for all ages! See the complete tutorial at Sassy Style Redesign. This giant Jenga not only looks beautiful, but it also comes with plans to build a handy carrying case to store all fo the pieces when it’s not in use. See the complete yard Jenga tutorial at The Idea Room. If you’re not in the market to DIY, check out this block tower set on Amazon. 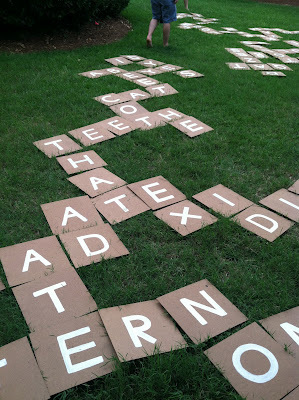 If you love word games, you need this giant 5 foot square Scrabble game on your patio. The game board is made out of concrete and the letters are made from baseboards. For more details check out Sunset. Who knew pool noodles could be used for so many fun games? Including making backyard obstacle courses! You can set up a football toss, agility rings, and even tunnels with a simple pool noodle. Get in on the fun with this tutorial from PBS Parents. Tic tac toe is a lot more fun when you can throw your pieces! 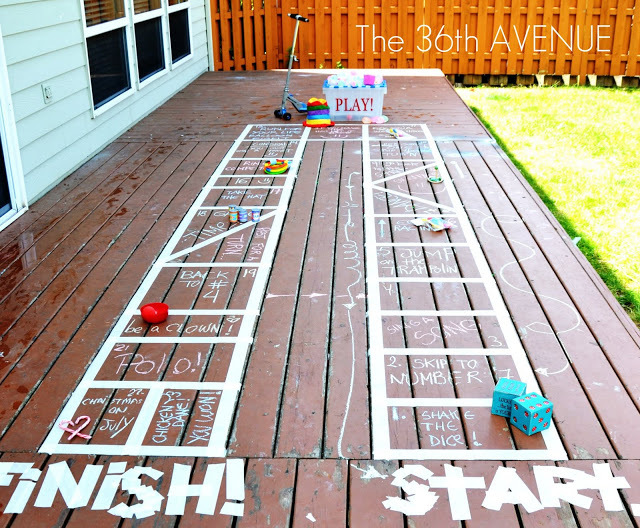 Use sidewalk chalk to make a simple tic tac toe on the concrete and use either bean bags or frisbees for game pieces. This is one of my go to yard games because it is so simple to set up and kids love it. 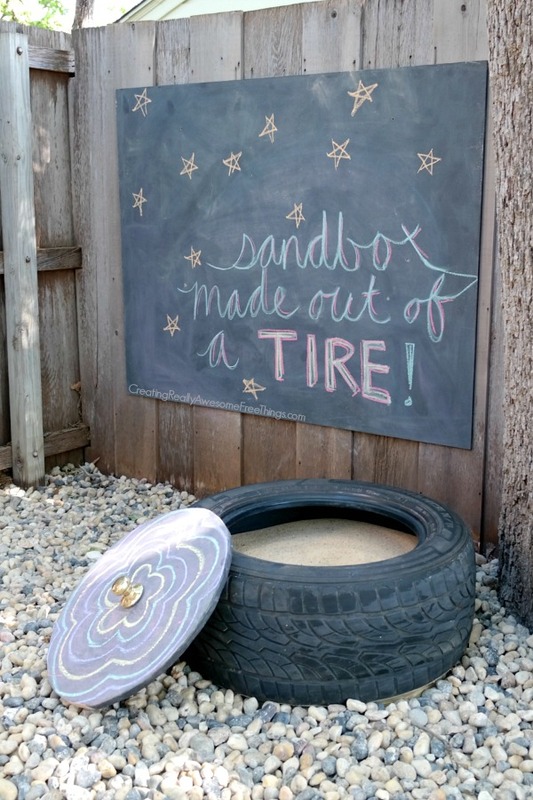 If you have a fancy chalkboard handy, great! 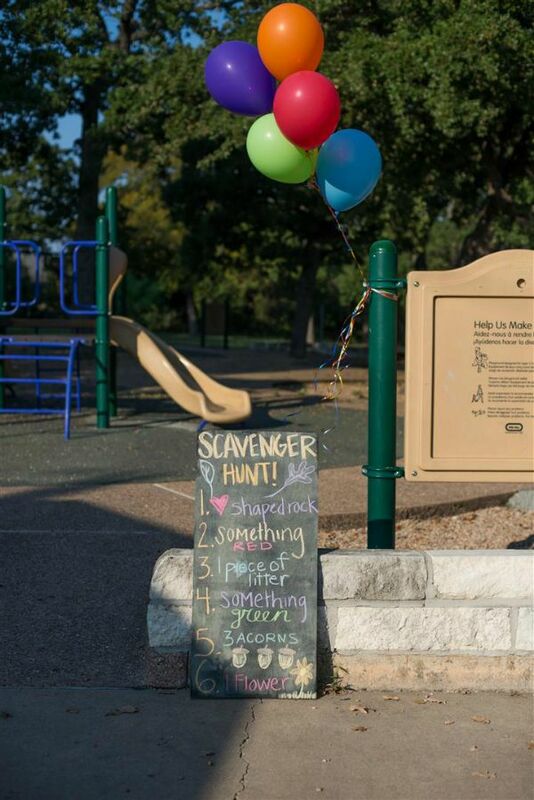 If not, just write the scavenger hunt items on concrete with chalk! Easy peasy! No net and no worries of falling off of this trampoline set in the ground. 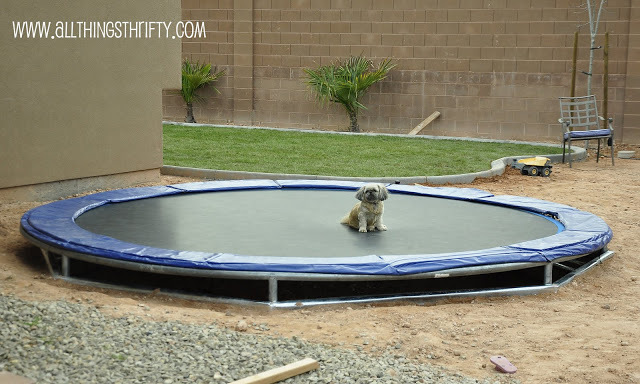 For $300 and using this tutorial from All Things Thrifty, you can have an in ground trampoline too. With 18 feet of PVC pipe and a few PVC tees and elbows you can make your very own ladder golf to play all summer long. For the detailed tutorial check out Momtastic. Some folk call washers urban horseshoes! 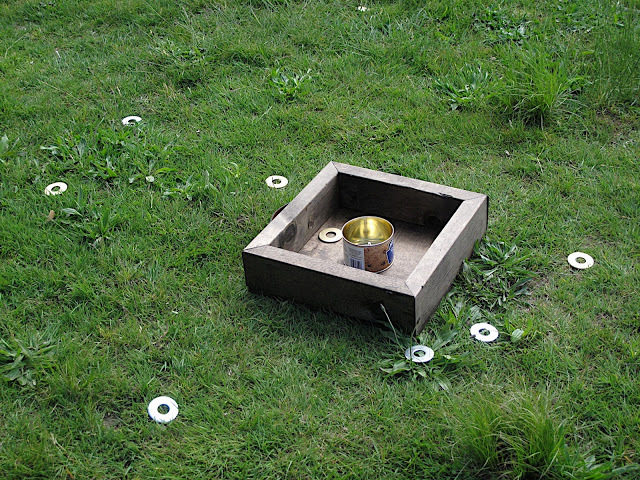 Whatever you call it, washers is a fun backyard game that’s easy to build. I love the addition of the leather handles on this set from ECAB. 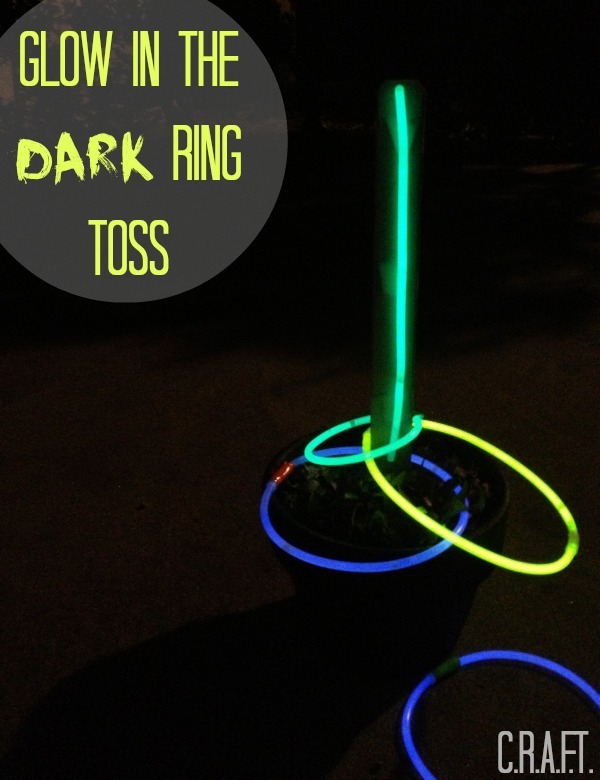 Ring toss is fun, but glow in the dark ring toss is way more awesome! This simple game can be built with a clay pot, rocks, and glow sticks! Check out Design Dazzle for the complete tutorial. 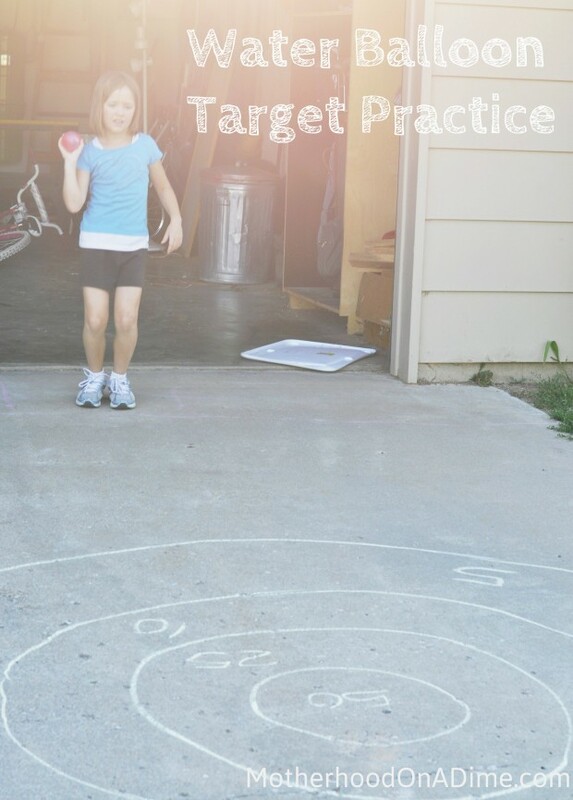 Water balloons are always a good idea, so why not add a sidewalk chalk target to practice your aim?! See more details on Motherhood on a Dime. 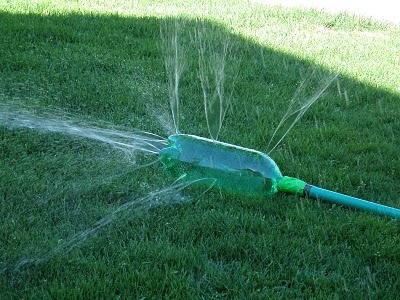 All you need to make your own sprinkler is an empty 2 liter container, tape, and a water host. This is a great craft for the older kids to take on and then share with the little ones all summer long. Check out the tutorial at Making Memories With Your Kids. What’s better than bowling in your backyard? Glow in the dark bowling in your backyard! Empty wtter bottles and glow sticks make for the perfect backyard bowling set. Check out Play Learn Grow for the full tutorial. Oh, those games look fun, Jamie! Great idea for a family reunion. What great ideas Jamie! 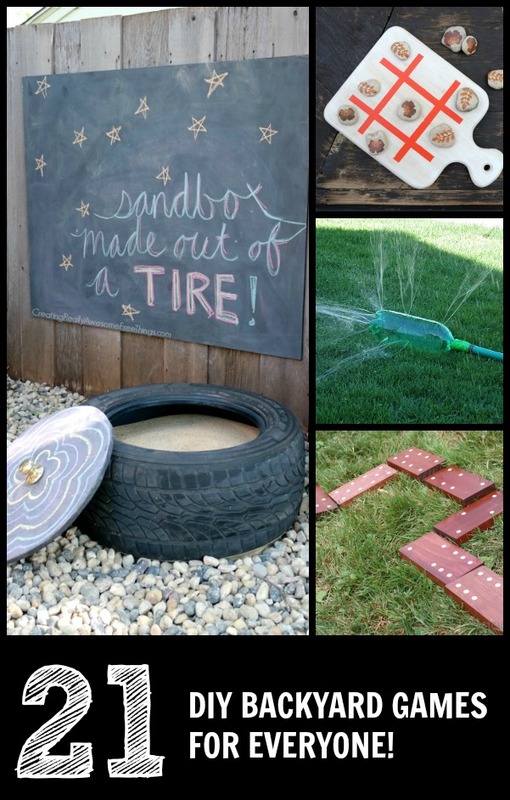 These would keep my kiddos busy all summer long! Thanks, Bonnie! Glad you like ’em! I love all of the games!!! Great round-up! Thanks for posting these…I need these for summer break!! Ouhhh these are awesome! Thanks for the inspiration! I love the ideas – they looks like sooo much fun! Thanks for putting that together!! Love this round-up! I think I’m going to let my kids go through this tonight and pick a couple for us to do this summer! p.s. Thanks for including my frisbee tic tac toe! I have played the board game and would like the dimension for it. I call it the “bean bag toss game”. this game is terrific for all ages. one person added hinges so that they could hang in in their garage. Pinned this away for summertime! Stumbled, too!